YOUNGSTOWN, Ohio – DiRusso’s Sausage Inc., a longtime company in the Riverbend Business Park, is expanding its building here to increase its storage capacity and improve operating efficiency. DiRusso’s is adding another 2,900 square feet to its manufacturing plant on West Rayen Avenue. The expansion will accommodate dry storage and packaging products and connect directly to the manufacturing area. Adolph Johnson & Son Co., Mineral Ridge, is the general contractor and the project is the fourth expansion the builder has done for DiRusso’s, said Paul Johnson, president of Adolph Johnson. The $250,000 expansion is the latest in investments the company has made over the past dozen years, DiRusso said. Recently, DiRusso’s added a new grinding and mixing system to its manufacturing operations. And, three years ago, the company bought the property across the street where a dilapidated garage stood. “It was a real eyesore,” DiRusso said. Since then, the company has spent more than $60,000 in renovating the old garage and turning it into a storage site, while spending additional money to reclaim the land. DiRusso, one of the founders of the Riverbend Business Park Association, said his cleanup effort is one aspect of a concerted drive that began 10 years ago of businesses reclaiming the entire Riverbend district. “The only eyesore in the park that’s left is the Cavanaugh Co. Building, and we’re trying to get the city to demo it,” DiRusso said. Posted in News & Press. YOUNGSTOWN, Ohio — On occasion, Robert DiRusso enjoys working the long hours at his company’s trailers at fairs and festivals, if only to remember how his business began. 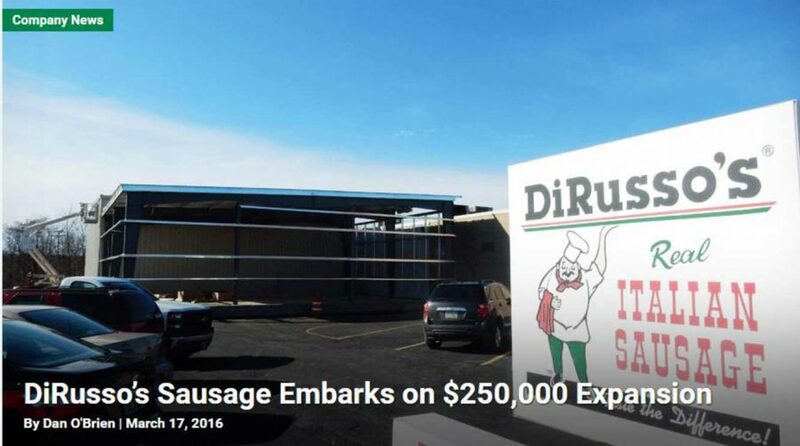 The business has come a long way from its origins as an Italian sausage concessions vendor. 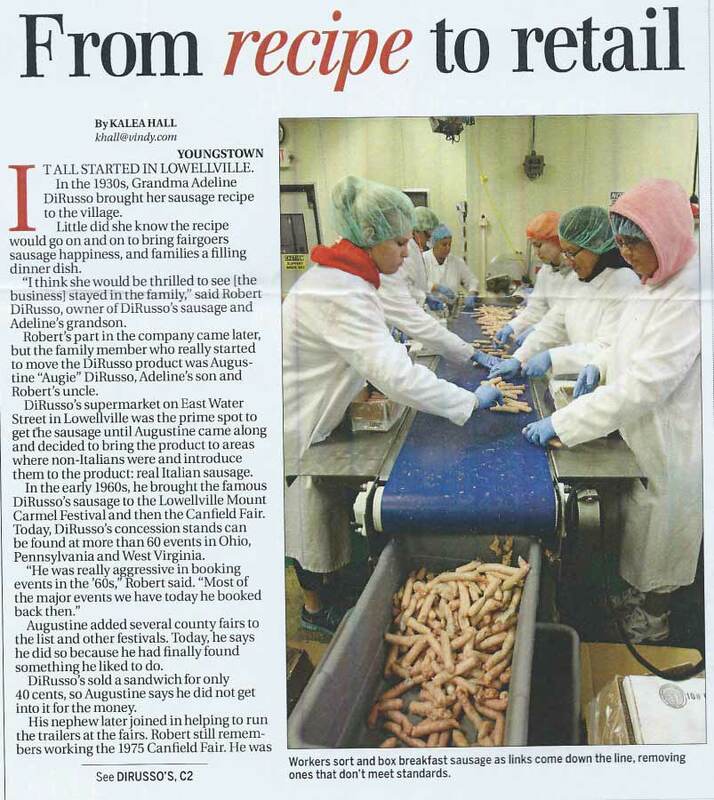 Since it was established in the early 1960s, DiRusso’s has grown into a manufacturer of Italian-seasoned meats that are distributed throughout the region. 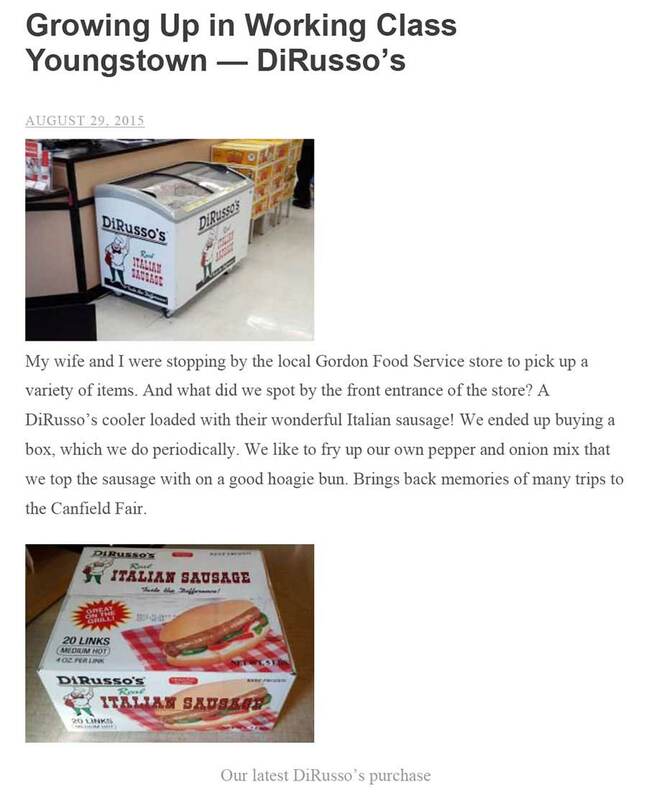 Indeed, the family recipe for Italian sausage was created in his grandparents’ old grocery store in Lowellville, DiRusso says. There his grandmother took her special seasoning and made Italian sausage for customers. 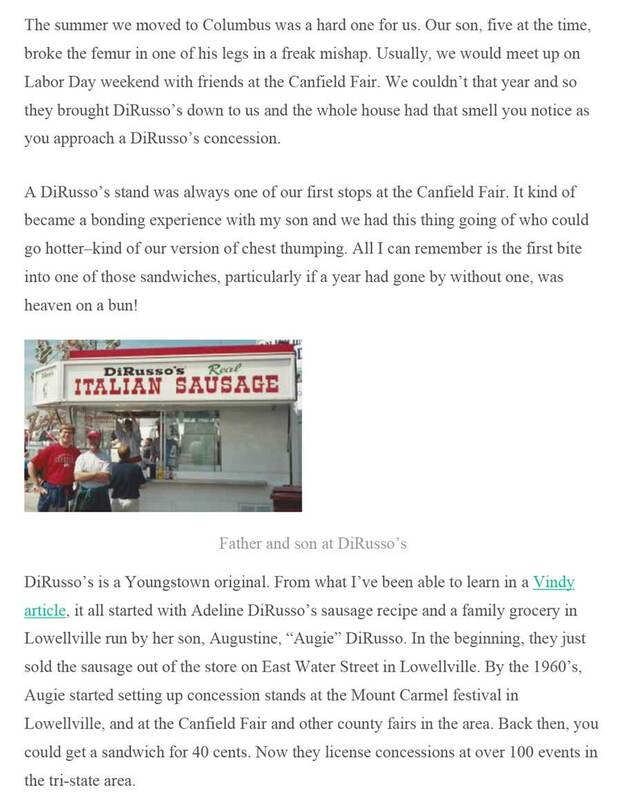 Then, in 1963, DiRusso’s uncle Augie seized the idea of buying several cooking trailers and taking the family’s sausage on the road – selling the specialty food at the many fairs and festivals throughout the Mahoning Valley. As demand grew, so did the need to expand and increase production, DiRusso says. 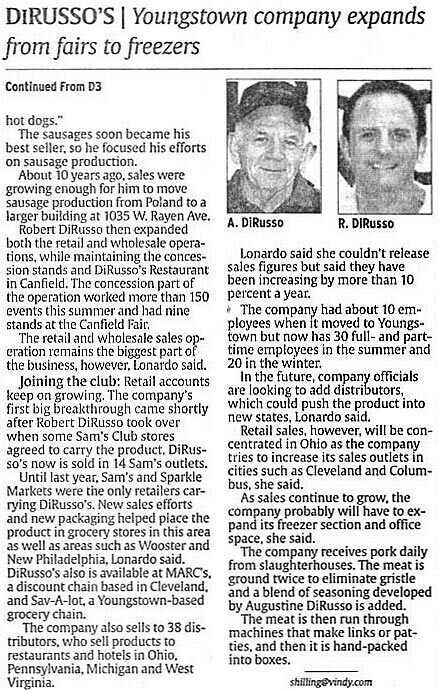 In 1985, DiRusso’s Sausage moved to its home along West Rayen Avenue in the Riverbend district of Youngstown. 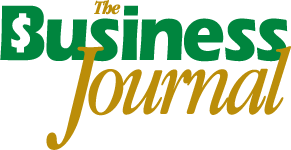 The company has steadily increased its footprint throughout the region over the last five years. “For years, we sold within a three-hour [drive] radius and barely touched Columbus,” Sciola says. 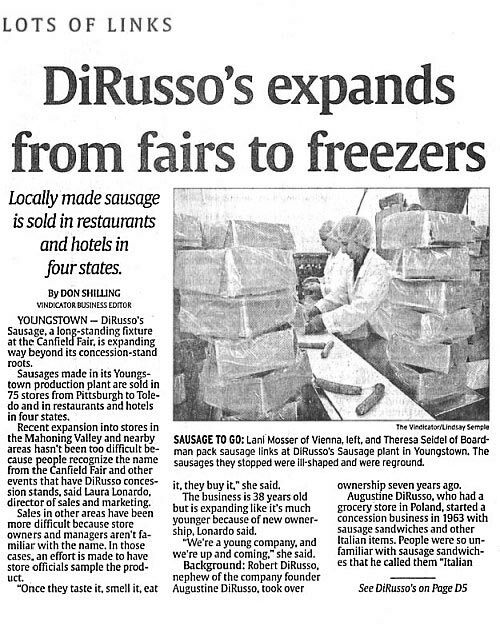 Now, DiRusso’s sausage can be found in grocery stores and restaurants in Cincinnati, Dayton, western Pennsylvania and southwestern New York. 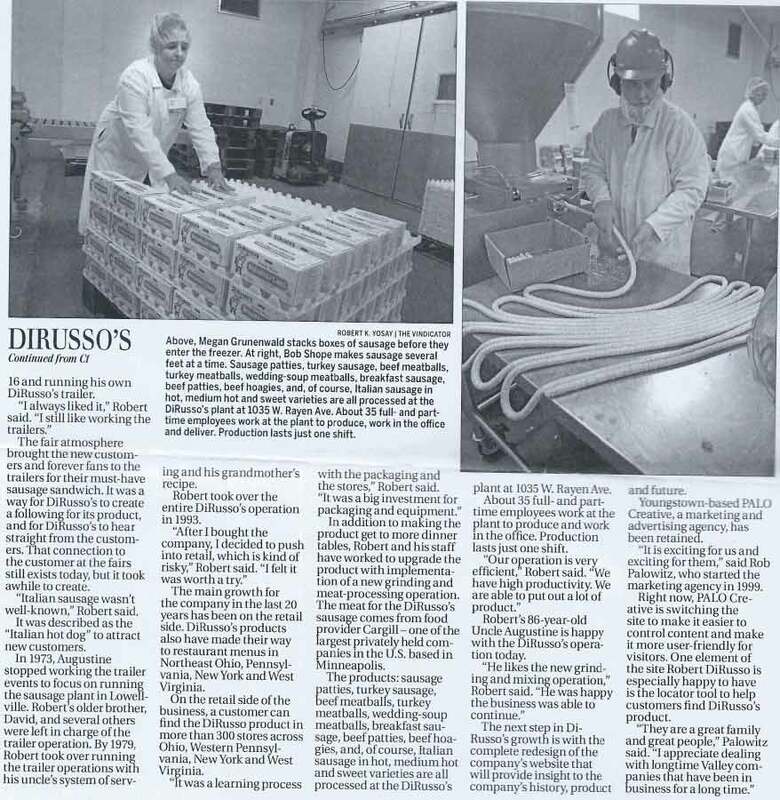 “We manufacture about 20,000 pounds per day,” running three to four days a week, says Michael Testa, production manager at DiRusso’s. 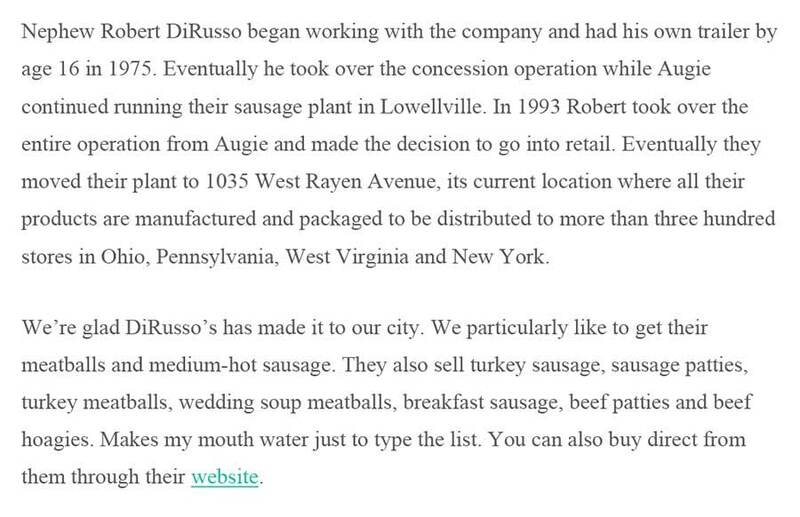 The majority of the product is pork used in the company’s sausage patties and links, but DiRusso’s also manufactures meatballs and turkey sausage links. DiRusso’s production plant is about as modern and automated a building you’ll find for such a small, family-owned business, Testa adds. DiRusso’s buys its pork from two farms in Illinois and Iowa, while the turkey comes from North Carolina, Testa says. Operations on this day are processing pork sausage links and patties, and the meat is trucked in from a farm to DiRusso’s, where it is immediately placed in a holding cooler at 32 degrees. Each batch to be processed contains 2,000 pounds of pork, Testa explains. The freshly butchered meat slides into a large three-step grinder – so named because it uses three different knives – that safely removes bone and other particles from the meat. Once this process is finished, the company’s special seasoning blend is added in a large mixer. 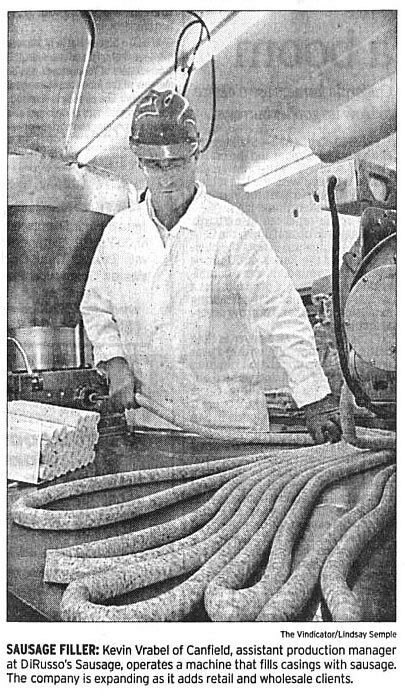 Once the proper seasoning and ingredients are added, the product is transferred to a “stuffer,” a piece of equipment that turns the ground sausage into long coils that are fed into a linker. The linker is programmed to apportion the meat to a specified weight and length, processing either large or small-link sausage. Each link is then transported along a conveyer belt, where it moves to packaging. The sausages are placed into boxes, each package weighing five pounds. “The whole process takes about 30 minutes,” Testa says. Once the product is packaged and placed on a pallet, the pallet is moved into a blast freezer where the temperature is 20 degrees below zero. “The sooner we freeze the product, the more shelf life we get out of it,” he says. After 24 hours, the pallets are removed from the blast freezer and placed into a holding freezer at zero degrees until they are shipped to customers, Testa says. Equally important, the company continues to reinvest in its local manufacturing operations to maintain quality and competitiveness. Although the company has long graduated from its concessions business, the odds are you’ll find a DiRusso’s trailer at all of the major festivals in the region. Pictured: DiRusso’s Sausage President Robert DiRusso says his grandmother created the recipe at the family’s grocery store in Lowellville in the early 1960s. 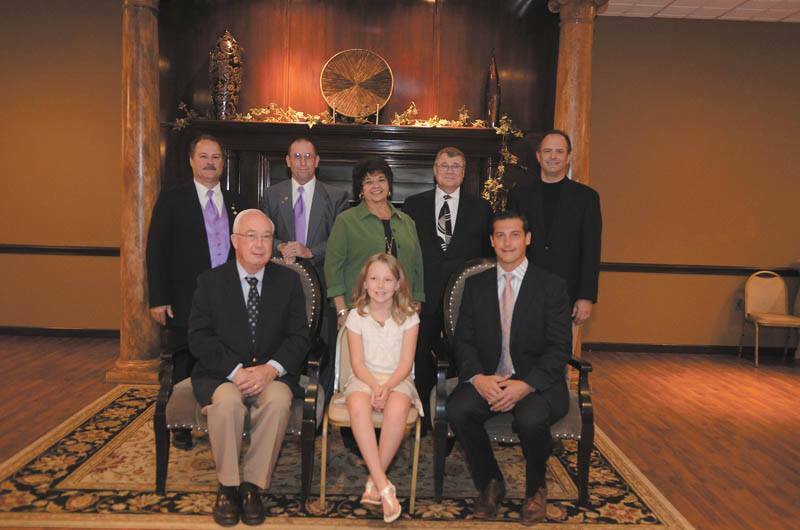 The Mahoning Shenango Chapter of the Association of Fundraising Professionals recognized individuals, organizations and businesses at a luncheon and reception on November 15, 2013. The event was the 23rd annual celebration of National Philanthropy Day. National Philanthropy Day is a nationally recognized event established by Congress in 1986. It recognizes the contribution that philanthropy and those people active in the philanthropic community have made. 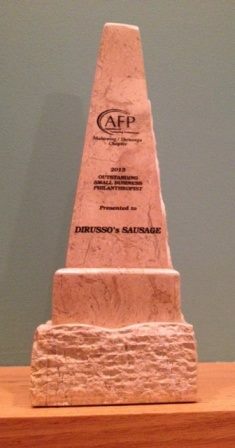 The “Outstanding Small Business Philanthropist” award was presented to DiRusso’s Sausage. 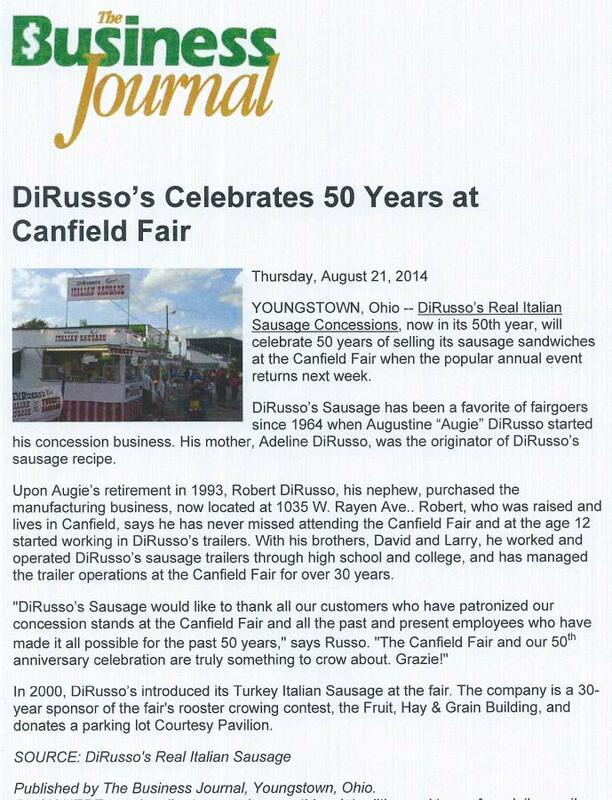 Robert A. DiRusso, president and owner of DiRusso’s, proudly accepted the award.